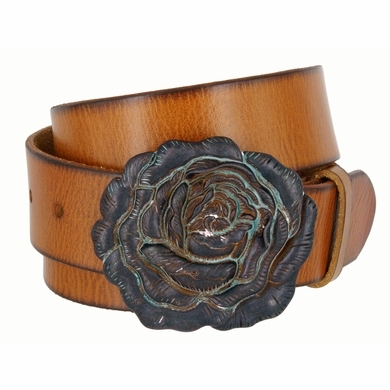 High quality copper patina rose engraved buckle with 1-1/2" (38mm) wide one piece full grain leather belt strap. Buckle size: 2-3/8" by 2-5/8"
Our belts are measured from where the leather ends at the buckle end to the middle hole at the tip end. Questions? Comments? Prefer to order over the phone? Call us toll-free at 1-888-692-3587.